In January 1830, the infant Thomas Hardy first saw the light of day in Devon, in the West of England. Twenty years later, he travelled to South Australia. In those days, the journey took a staggering twelve weeks. 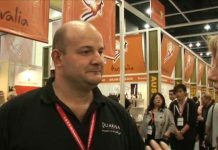 Another twenty three years later, he founded The Hardy Wine Company in Adelaide and the business soon became South Australia’s largest winemaker. Hardys (without an apostrophe, for some reason) has grown into a massive organisation. It never seems to stop. Hardys is now part of Constellation Wines, which is the largest wine company in the world. The company produces a very wide range of wines and the Nottage Hill selection first appeared in 1967. 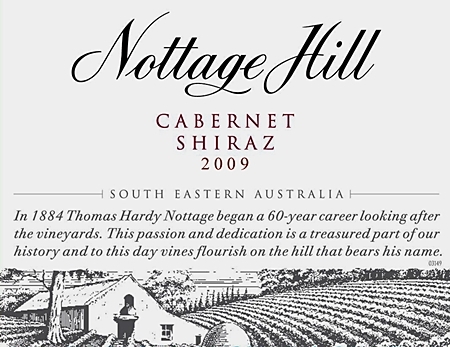 The Nottage Hill range consists of a dozen interesting varietals which are all crafted for consistency. 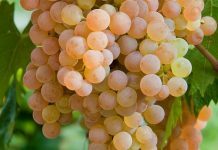 This means that regardless of the year, each varietal will taste pretty much the same. This wine is rather lovely to look at in the glass, with thick legs appearing when you swirl the wine around. At one time, it was thought that these “legs” were a sign of quality. Without writing a paragraph on advanced physics, which would be a challenge for both of us, let me just say that they are caused by surface tension and known as The Marangoni Effect. It could make a good name for a science-fiction movie. The wine is a deep crimson colour and has a rich fruity aroma of plums, dark berries and rhubarb. There’s also the tiniest hint of crushed black pepper. 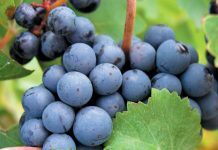 It has a soft, almost sumptuous mouth-feel, really warm and beguiling with ripe plums, berry fruits and barely a hint of tannin. There’s a delicate touch of tannin on the finish. It’s medium dry with an attractive hint of sweetness and a touch of spicy oak. It’s a very well-crafted wine – no doubt about that. But it’s also rather commercial in style. The wine has a distinctive Australian feel to it and you couldn’t possibly confuse it with a wine from Bordeaux. At just 13.5% alcohol this is a pleasing easy-drinker, but if you prefer your wine with food I think it would partner most red meat dishes successfully, but it’s a bit too smooth for pizza and pasta. I always think pasta needs a wine with a bit of sharpness to contrast with the sauce which is why wines like Chianti and Valpolicella work so well. If you hold your glass against a plain white background, you’ll see the attractive greenish-gold colour of this wine. Swirl it around and those long “legs” will appear. And what’s the effect called? (No cheating, please). There’s an almost creamy Chardonnay aroma. I know the expression “tropical fruits” is a bit of a cliché but honestly, that’s what springs to mind. If you want me to be more specific, then I will. (Of course, you’ll understand that there is a small charge for this additional service, for expertise doesn’t come cheap.) Well then, pineapple comes out first with white peaches and melon in the background. There’s just a hint of citrus and a suggestion of oak and honey. There’s also a hint of cucumber which I know is not a tropical fruit, but you did ask for more details. Right, that’s fifty baht please. This full-bodied wine has a lovely silky-soft mouth-feel with plenty of fruit up front. However, it’s pretty dry with a dash of acidity and there’s a rather elegant long finish with a faint mineral flavour in the background. Like the Cabernet-Shiraz, this is a commercial style of wine, but it sells by the truck-load so obviously a lot of people enjoy it. At just over 13.5% alcohol, the wine is easy to drink and undemanding, so it would be pleasing to drink its own. It would work well with seafood or chicken dishes and some milder Thai dishes too. Serve it quite cold but not freezing, otherwise the aromas won’t come through. And don’t forget the fifty baht.